Paperless Forms for Mobile Workers in Minutes! Datadroid is a mobile data capture solution that replaces paper forms with electronic forms. Our mobile app utilizes Android phones and tablets to deliver mobile forms to your workers via the Internet. Your mobile workers may include surveyors, auditors, inspectors, couriers or another role that requires working off site with paper forms. Paper forms are wasteful, require printing, can get lost, require manual re-entry etc. Datadroid frees your workers from the disadvantages of paper forms and replaces them with the benefits of electronic Android forms. Electronic forms do everything that paper forms do as well as capture photos, signatures, GPS coordinates and self validate (all features). Your mobile workers no longer need to come back to base to deliver a completed report; they simply submit over the web to your secure portal ready for export to PDF and Excel. We provide you with a form builder, PDF/Excel report generator and an app for each of your mobile workers. The form builder is online and accessible from any modern web browser. You don't need to be a programmer to use it - all you need is to know what you want your form to look like. Datadroid requires no permanent Internet connection, no booting or fiddling with cables. Any activity that currently involves a paper-form being completed can now be done using Datadroid anywhere and at any time. Mobile World Congress is the world's largest exhibition for the mobile industry and a conference featuring prominent Chief Executives representing mobile operators, device manufacturers, technology providers, vendors and content owners from across the world. 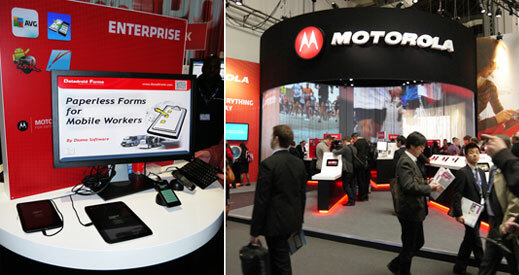 The Datadroid team were proudly invited by Motorola Mobility to be part of the largest and most exciting MWC to date. This year's MWC took place in sunny Barcelona at Fira. We had a fantastic time meeting the attendees and demonstrating Datadroid on the latest technology from Motorola. Datadroid is a mobile data capture solution that replaces paper forms with electronic forms on your android device. Our tools allow organisations to create forms that are accessible to its mobile workers anywhere any time. By eliminating paper and transmitting forms electronically Datadroid can increase worker efficiency, streamline your business and therefore save you money. "The Motorola Razr, Atrix 2, Xoom2, Xoom 2 Media edition were a pleasure to work with and each have their individual benefits for those using Datadroid. The Motorola Defy really impressed us; its dust proof, water and scratch resistant qualities are perfect for Datadroid users working in abrasive environments where smart phone damage potential is high." Specify report recipients while you work! Simply click the “Report Recipients” button and input the email addresses. Datadroid will automatically produce a PDF version of your report and email it to your specified recipients as soon as you submit. 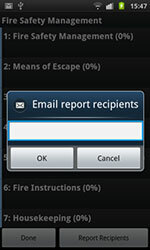 This functionality is perfect for situations where report recipients are not know before work is carried out e.g. A surveyor that wishes to email a completed survey to his/her customers. Give the standard PDF report a personal touch by branding it with your company logo. Simply upload your logo in the “Admin” area and Datadroid will automatically add it to the top of every PDF report that you export. You can export your branded PDF reports manually or have them automatically emailed to the recipients of your choice. Download your reports as MS Word documents! Simply select the reports that you want to export, highlight "Selected to MS Word" and then click "Export". Your reports will be downloaded as Docx files ready for you to open and edit as necessary. Ever wanted to automatically email your completed reports as soon as they are submitted? Or export them in PDF format?Well now you can! Datadroid can now send a PDF report directly to your email recipients as soon as a new report is created. It's Simple! Just specify your report recipients when you create a work package.